Jesus despises the faith of self-righteous Jews, and he makes a point of commending deliberately the deeper faith of non-Jews. In the story of the Good Samaritan, a supercilious lawyer asks Jesus what he must do to inherit eternal life. Jesus answers his question with a question: "What is written in the Scriptures? How do you understand them?" The man replies: "The Scriptures say, 'Love the Lord your God with all your heart, soul, strength, and mind.' They also say, 'Love your neighbours as much as you love yourself.'" (Luke 10:26-27). Jesus then tells the man: "You have given the right answer. If you do this, you will have eternal life." (Luke 10:28). It is important to note that Jesus' prescription for eternal life is free of religion. He does not tell the man: "Be a Jew, and you will inherit eternal life." Therefore, it cannot be presumed today that being a Christian is the passport to eternal life. According to Jesus, eternal life belongs to those who love God deeply and passionately, and who also love their neighbours. This means eternal life is available to anyone, irrespective of religious affiliation. It means, for example, eternal life is available to both Christians and Muslims, as long as they fulfil God's requirement to walk in love. However, the discussion does not end there. The scriptures say the lawyer, wanting to justify himself, then asks Jesus: "Who are my neighbours?" Jesus' answer to this question remains just as pertinent today. Who are the neighbours of the Christian? Jesus' interrogator in the scriptures was a Jew, so he presumed he was only required to love other Jews; perhaps only those living in close proximity to him. Today's self-justifying Christian might also presume he is only required to love other Christians. 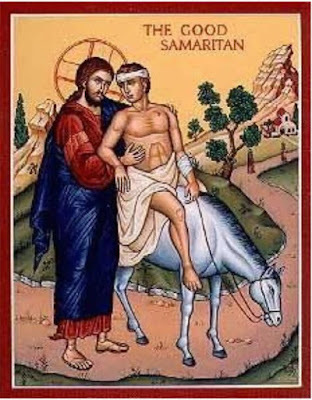 Therefore, Jesus gave us the seminal story of the Good Samaritan. At the time, the Samaritans were religious opponents of the Jews in a way similar to the religious divisions in Nigeria today between some Christians and Muslims. The Samaritans looked towards Mount Gerizim for worship, while the Jews looked towards Jerusalem. In Nigeria today, Christians go for pilgrimage to Jerusalem, while Muslims go to Mecca. In the days of Jesus, the Jews considered themselves to be God's chosen people. Therefore, they regarded Samaritans, who they insisted did not belong to the commonwealth of Israel, as infidels. Today, we Christians consider ourselves to be the Jews of yesterday. We call ourselves the "spiritual Israel;" sons of God and heirs of the kingdom of God. Jesus' teachings are designed to discourage this exclusionary line of thinking. But the problem is that many Christians refuse to listen to him and heed his warnings. Jesus despises the faith of self-righteous Jews, and he makes a point of commending deliberately the deeper faith of non-Jews. For example, he commends a Roman centurion who is not of the Jewish faith and warns the Jews: "I tell you that in all of Israel I've never found anyone with this much faith! Many people will come from everywhere to enjoy the feast in the kingdom of heaven with Abraham, Isaac, and Jacob. But the ones who should have been in the kingdom will be thrown out into the dark. They will cry and grit their teeth in pain." (Matthew 8:10-12). This warning should be heeded by self-righteous Christians who presume we are in with God just by virtue of being Christians. We also believe everyone else who is not a Christian is done for. According to Jesus, such Christians are in for a big surprise when we see Muslims, for example, enjoying the feast in the kingdom of heaven with Abraham, Isaac and Jacob. We will cry and grit our teeth in pain. This is part of the reason why Jesus tells the story of the Good Samaritan. In this story, a man traveling from Jerusalem to Jericho is attacked by armed robbers who leave him half-dead by the roadside. A priest passes by, but when he sees the man, he crosses over to the other side. A Levite also passes by, looks at the man and continues on his journey. But when a Samaritan passes by, he comes to the man's rescue. Jesus asks the lawyer to whom he tells the story: "'Which one of these three people was a real neighbour to the man who was beaten up by robbers?' The lawyer answers: 'The one who showed pity.' Jesus then says to him: 'Go and do the same!'" (Luke 10:36-37). It is often overlooked by Christians that this story is, by implication, a lesson on religious tolerance. It is also anti-religion. Those who do not do the will of God in Jesus' story are the Jewish religious elite, the priest and the Levite. Moreover, they are the ones who represent the Christians of today. However, the Samaritan, the very man despised by the Jews, is the one who does God's will by showing mercy. Therefore, it becomes clear that if Jesus were addressing Christians of Nigeria today, his Good Samaritan would be a Muslim; and if he were addressing Muslims of Nigeria, his Good Samaritan would be a Christian. It is the values and precepts of tolerance and compassion for others that determine our inheriting the kingdom of God. Jesus does not prefer Samaritans to Jews. Neither would he prefer Muslims to Christians or Christians to Muslims. If the lawyer had identified the Samaritan as the real neighbour to the injured man, his answer would have been wrong. The real neighbour is religion-free. He is simply: "the one who showed pity." The one who shows pity could be just about anybody. He could be a Christian or he could be a Muslim or he could be of other faiths. According to Jesus' kingdom dynamics: "the merciful shall obtain mercy." (Matthew 5:7). Religious affiliation is not a passport to heaven. Instead, Jesus says: "By their fruits you will know them." (Matthew 7:16). The scriptures do not say Jesus is only the saviour of Christians. They say he is "the Saviour of the world." (1 John 4:14). Christians must not be supercilious but tolerant of non-Christians. We cannot presume we have the copyright on God. In Nigeria, Christians must be tolerant of the faith of Muslims especially. Some of us have multi-faith backgrounds. Some have Christian fathers and Muslim mothers or vice-versa. In my case, my maternal grandmother was a Muslim. It makes no difference according to Jesus: our responsibility is to love one another. I have met many Muslims who have played the role of the Good Samaritan in my life; and I have equally met many Christians who have done likewise. All faiths seem to have one thing in common: they teach and believe in the love of the neighbour. Jesus tells the story of two men who went to pray in the temple, the one a self-righteous Pharisee and the other a tax-collector despised by the Jews. The Pharisee presented his credentials of faith before God and looked down on the tax-collector. However, the tax-collector stood in contrition asking God for mercy. Jesus warns: "If you put yourself above others, you will be put down. But if you humble yourself, you will be honoured." (Luke 18:14).